Retail executives from around the world converged in New York City Jan. 14-16 for the National Retail Federation’s (NRF) BIG Show. The retail industry’s premier showcase, executives attend NRF every year to find solutions that will improve store performance and ultimately increase company-wide sales. 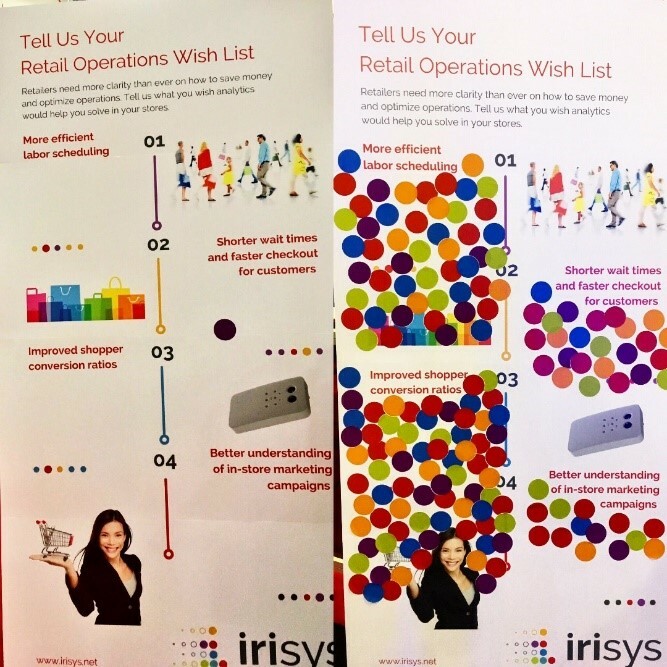 At the show, Irisys held an interactive survey to identify what performance areas retailers are relying on analytics to help them reach their goals. The responses from the 160 participants of the “Retail Operations Wish List” survey were clear – better customer conversion is the top priority. More than 52 percent of the those surveyed said they need a retail analytics solution to help them increase conversion ratios. These results confirm our 2017 NRF survey results where more than 47 percent of the 192-surveyed last year stated the same needs. Not far behind conversion, more than 34 percent of respondents said more efficient labor scheduling is the highest value retail analytics can provide their in-store operations. This is yet another year-over-year validation as more than 32 percent of 2017 participants believed the same. These clear and consistent survey results mean retailers are not only in need for better in-store analytics, but they are actively looking for solutions that will help increase revenue and decrease costs. But it’s not enough to just have analytics. Retailers need the right kind of analytics to help them meet business objectives, meaning data prioritization must happen for brick-and-mortars. For retailers, it is vitally important to understand the nuances of shifting customer traffic and other data – particularly as online stores chip away at brick-and-mortar customer bases – to ensure in-store strategies are optimized for customer experience, customer service, traffic flow and sales opportunities. No matter how familiar retailers are with people counting technology and analytics, selecting a vendor who is committed to your success and has the right tools to achieve it is critical. Retailers should look for vendors who have the most innovative, industry-leading solutions at their disposal to increase operational efficiencies and expand revenue opportunities. Irisys’ queue management and people counting systems, for example, are among the best solutions available to help retailers capture and capitalize upon those high-priority analytics that can move the revenue needle. Utilizing the data that people counting and queue management systems provide can uncover a wealth of strategic improvements that can boost the bottom line – aligning store layouts with traffic flow, optimizing staffing and even adjusting operating hours to better suit customers’ schedules. Vector 4D with Estate Manager Plus (EM+), developed by Irisys and showcased at NRF’s BIG Show, is the newest, most advanced technology platform on the people counting market today and further improves the accuracy and expands the capabilities in how footfall data is collected. The platform expands the widely popular Estate Manager software solution to include features developed based upon extensive research and feedback from end-users and retail partners. EM+ further improves the accuracy and expands the capabilities in how footfall data is collected when paired with Irisys’ latest people counting device, Vector 4D, which utilizes state-of-the-art Time of Flight (ToF) technology. Vector 4D’s ToF technology is a cutting-edge solution that detects, tracks and measures people’s movement – including dwell time – to deliver a new, more complete picture of retail traffic that is clearer and more accurate and simply unachievable by other technologies like stereo video. The introduction of ToF technology expands the capabilities – and value – of the people counting device. Besides counting customers, Vector 4D can be configured to eliminate or count children as customers utilizing height measurement technology; deployed to monitor shopper dwell times; and installed in areas where older technologies cannot perform. This means retailers, partners and other end-users can access the most complete picture possible and draw their own conclusions from the data – empowering stronger decision-making for better store performance.